Long, long ago, in the 5th century, a king, called Brychan Brycheiniog (son of an Irish King), had 36 children. By all accounts, Dwynwen was one of the prettiest of Brychan Brycheiniog’s 24 daughters. They lived in Brycheiniog (Brecon). Dwynwen fell in love with a young man called Maelon Dafodrill. She wanted to marry Maelon but unfortunately her father had already arranged that she should marry someone else. Dwynwen was heartbroken. In her grief she fled to the woods where she begged God to make her forget Maelon. After falling asleep, an angel visited Dwynwen carrying a sweet potion. Dwynwen decided to given the potion to Maelon. However, when he drank it, he turned into ice! that she should never marry. All three wishes of Dwynwen’s wishes were fulfilled. 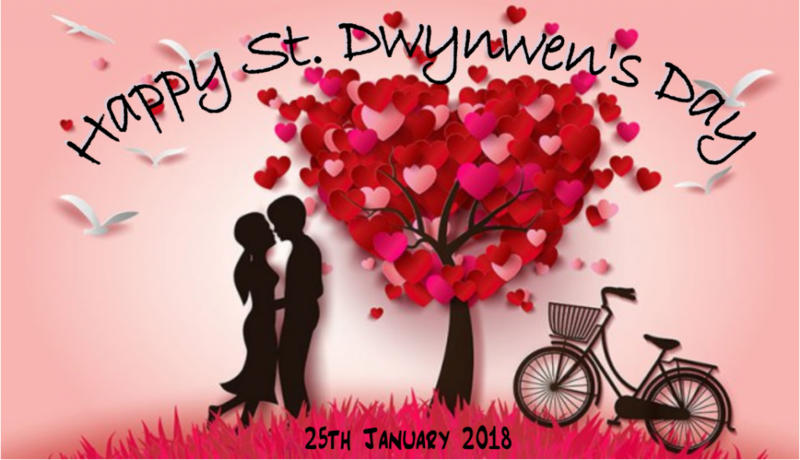 As a mark of thanks to God, Dwynwen devoted herself to God’s service for the rest of her life. She sailed off in a boat that took her to a little island off Anglesey. That place is today known as Llanddwyn (Dwynwen’s church). She stayed on Llanddwyn Island off the west coast of Anglesey and became a hermit until her death in about AD 460. It is still possible to visit the remains of Dwynwen’s church today on the island of Llanddwyn. During the 14th century, on visiting the island, the poet Dafydd ap Gwilym witnessed a golden image of Dwynwen inside the church. Also situated on the island is Dwynwen’s well, where, allegedly, a sacred fish swims, whose movements predict the future fortunes and relationships of couples. Visitors to the well believe that if the water boils while they are present, then love and good luck will surely follow.